VARANASI, INDIA - 19 FEBRUARY 2015: Vehicles and people passing down the street, while a man stands at the corner. JODHPUR, INDIA - 17 FEBRUARY 2015: Indian men in front of a workshop in Jodhpur while vehicles and people pass. JODHPUR, INDIA - 17 FEBRUARY 2015: Indian man in front of a workshop in Jodhpur while vehicles and people pass. 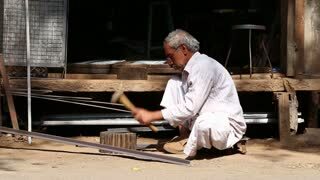 JODHPUR, INDIA - 17 FEBRUARY 2015: Indian man shaping rod at the street while vehicles and people pass. 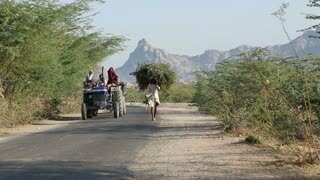 JODHPUR, INDIA - 13 FEBRUARY 2015: Man walking down the road with pile of hay on his head while vehicles pass. JODHPUR, INDIA - 12 FEBRUARY 2015: People and vehicles passing the road in Jodhpur while man works by bus aside. JODHPUR, INDIA - 12 FEBRUARY 2015: Portrait of man standing at doorstep while people and vehicles pass by. JODHPUR, INDIA - 11 FEBRUARY 2015: Man on motorbike standing by the road while vehicles pass by. 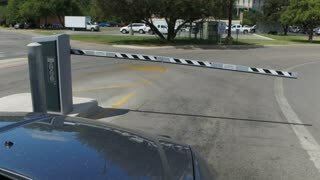 A vehicle enters a gated parking lot.